Today I spoke with Dr. Susan Blum on her 4-component plan for healing autoimmunity. We emphasize the importance of gut health, of course, but also get into an interesting debate regarding what type of diet is best for autoimmunity. We also cover the importance of stress and toxins. If you need help with healing autoimmunity, click here. Dr. Michael Ruscio: Hey everyone. Welcome to Dr. Ruscio Radio. Today we are talking autoimmunity, a great topic, with Dr. Susan Blum. Susan, welcome to the show. DrSB: Thank you for having me. Happy to be here. DrMR: Pleasure to have you here. And we were just talking about bios, and how your team had sent over quite a lengthy bio. Which is fine, don’t worry about it. Because I usually just ask people to tell us a little bit about themselves, their background, their training, how you got into autoimmunity, kind of to kick us off here. DrSB: Ok. Well that’s great, because as you just mentioned, I said, “Please don’t read that whole bio!” I just looked and saw they sent this long thing. So, I’m a conventionally trained doctor. My credentials are—I went to a good medical school, and so I’m trained in preventative medicine is what my background is, my board certification. That’s my sort of basic “training.” And I did an internal medicine residency. So I came from that world of medicine and internal medicine. I just was always interested in prevention. Or at least, for sure when I was in the hospital doing all my training. I just saw this medicine that was being practiced, which we call downstream medicine. It’s the end result. You see the heart attack in room 10, and the diabetic is in another room, and someone else with a stroke. And they’re all sort of at the end of what was a long process that started a long time ago. And I became very interested in trying to figure out “How could we get further upstream? What does it mean to try to prevent illness?”—when you think about upstream medicine. And I ended up finding—well, back when I did all my training, I ended up then going into the specialty of preventative medicine. And that’s what I’m board certified in, and I did my residency at Mount Sinai; I’m still on faculty. I have a faculty appointment at the Icahn School of Medicine at Mount Sinai, so I’m still involved with that. But, prevention from a conventional perspective is very much about early detection. At least that’s what it is was—I’m aging myself a little bit. It was a while ago when I did my residency. And even so right now, preventative medicine is very much—and I did my master’s in public health, and I’m trying to figure out how to do—it’s prevention programs. It’s not really sort of roll up your sleeves, figure out how to help people know what to eat—nutritional medicine—figure out how to help them manage their stress, which is really the mind-body medicine. Really it didn’t approach how to do this in a clinical practice. So I ended up leaving the box, I guess, so to speak, and finding those resources in other organizations. I ended up—my first step was with the Center for Mind-Body Medicine as I was trying to figure out who I want to be when I grow up. And I was 38 or so, you know. I ended up at the Center for Mind-Body Medicine, and learning about how stress affects us, tools to teach patients, tools for myself, for how to bring balance, and really understanding the connection between your emotions, thoughts, and feelings, and that stress response. And how it triggers inflammation, how it causes disease, and how we need to look at it in a little different way as really a potential trigger and cause. And this is evidence based. And from a functional perspective, we go to all sorts of interesting places that conventional medicine doesn’t go. Like looking at the gut microbiome. Looking at toxin overload. Too many toxins in the body triggering inflammation and autoimmunity. Looking at the other causes. Looking at food. We were the first ones to really look at food sensitivities and gluten, and for sure the gut. So, I was just so excited when I discovered functional medicine. So that sort of takes you through my history and my background. I ended up really—at around the same time I discovered functional medicine, I discovered I had an autoimmune disease. And it’s called Hashimoto’s thyroiditis, and it’s an autoimmune condition of the thyroid gland. And I was shocked, because I thought I was pretty healthy at the time. I ended up—it was right at the same time that I was really stepping outside the box, and trying to figure out how I wanted to practice medicine as well. I ended up using all these functional medicine approaches that I was learning, and the mind-body medicine to cure myself of the autoimmune condition that I had. And I just discovered this whole other way of looking at the body. And I decided to write a book about it. And I sort of grew, and I opened a health center. So now I’m the founder and director of Blum Center for Health. Just to sort of tie my bio back to who I am. This was about 15 years ago when all this happened. So now I have a health center with a whole teaching kitchen and lifestyle education center. And we practice functional medicine. I have 5 other doctors, and I have a nurse practitioner, nutritionist, health coach. We have a big team, and we take care of a lot of people. And I wrote a book in 2013 called The Immune System Recovery Plan, which is really these steps that I learned to heal myself. I then started working with everyone who came to see me, and with tremendous results. So I put it into a book. And that’s what we’re here to talk about today. DrMR: Awesome. And I should probably apologize for mispronouncing your last name. I think I’ve heard it pronounced differently by so many people that I got that in my head. People always mispronounce my last name, so I apologize. DrSB: How do you pronounce your last name? DrMR: It’s Ruscio, and people often say “Rusc-io.” It’s not too far different, but it’s Ruscio. DrSB: Ruscio. And I’m Blum, like plum. DrMR: Yep. So Blum, Blum, Blum. Got it. DrMR: Now, for the audience, I’m sure people listening probably know what an autoimmune condition is. But just really briefly, it’s essentially when your immune system attacks your own body, to put it really simply. Anything you’d add to that? DrSB: Yes, no. Well, when your immune system attacks your own body. Exactly. And there are over about 100 different autoimmune diseases. That’s really the simplest way to say it. It’s really a renegade immune system. A healthy immune system is one that responds when it’s supposed to to a foreigner; it’s supposed to be some foreign trigger. Whether it’s infection, or a toxin, or even renegade cells in your own body, right? Like cancer cells. Because your immune system is supposed to clear those. We’re always making cancer cells, and we’re always having abnormal cells, but our immune system clears it away. So your immune system is supposed to turn on when it’s supposed to, and then turn off when it’s finished. And in autoimmunity, the immune system can be turned on to the wrong things, and/or just turn on, but then not turn off. And it sort of becomes a runaway train. And it might turn on appropriately to a virus, let’s say, but then never turn off. And when it doesn’t turn off, it eventually spills over and then starts attacking other parts of the body, as well. So yeah. So that’s sort of a good way to think about autoimmunity. DrMR: And they’re fairly common. I believe, according to NIH data, if you take autoimmune conditions and classify them as one group, rather than these various subset diagnoses, then they’re almost as common as heart disease and about, if not slightly more common, than cancer. Which puts it between spot 1 and 2 in terms of disease prevalence, at least for most Westernized countries. So these are pretty common conditions, so there’s probably a fair number of people listening that either have an autoimmune condition, or knows someone that has an autoimmune condition. So it’s definitely something that I think the audience probably knows about, probably has heard about. And people have probably also heard about all these things that can be the underlying environmental factors that can lead to or increase the prevalence of autoimmune conditions, like if you were breastfed, if you were a caesarian section birth, the hygiene that we live in being more sterile in Westernized societies. But instead of getting too deep into that, Susan, why don’t we focus a little bit more on things that people can do now to try to fix those problems. And I say that, because sometimes in the clinic I see people coming in, and they’re very distraught about stuff that happened to them many, many, many years ago that they have no control over, right? DrMR: So, we want to be aware of these things to try to hopefully update public policy and be aware of these things with our own children, and our own health care, and environmental hygiene going forward. But let’s transition now into the plan. DrMR: Yeah. To the plan we can do now to try to help. I believe in your book you codify this into four pillars, correct? DrSB: Yes. So four foundations for a healthy immune system is one way to think about it, or a 4-step plan for repairing the immune system. And so yes. The main—what my approach to working to repair the immune system really is looking at, four, and I will say five because I talk about infections somewhat, but as an approach to repair work that we’re going to do. The 4-step approach to repairing your immune system is looking at food, looking at stress, healing the gut, and decreasing the toxin load in the body. The fifth one are infections, because infections are definitely triggers for autoimmunity. But if you have chronic infections that are persisting, to clear those you have to repair the immune system. Which is food, stress, gut, and toxins. So in some way, doing the four steps will help you with the viruses, if that is one of your triggers. I do want to circle back, though, just to add to what you said about, “Let’s start with now and move forward.” So, when we talk about, for example, the gut microbiome, which is step three: healing the gut. And the gut is a foundational trigger. I mean this is so much research in the gut, and actually my next book, which is called Healing Arthritis, is coming out in the fall. I devoted a whole book to the gut-arthritis connection, because of all the research in the past 5 years that’s emerged. Starting about 10 years ago, but really the past 5 years a lot of studies really looking at the altered gut microbiome. And what’s the gut microbiome? Let me just define it for the listeners. We estimate about 100 trillion friendly flora, bacteria, that live in our gut. And they’re also on our skin, and in our lungs. There’s probably more of them than us. There’s always this joke about who is living with who. But the microbes do really good things for us, and one of the most important things that they do is they help our immune system work right. 70% of your immune system lines your intestinal—is right below your intestinal lining. So you have this barrier. Your small intestine and large intestine is like a tube. And the outside of the tube, the wall, is a barrier between what’s inside and the rest of your body. And then the bacteria line the inside of the tube, which we call the gut lumen. And the immune system lives on the other side of that wall. And if the bacteria get out of balance—and we use the analogy about flowers. So we use the inner garden analogy. So the bacteria, these flowers, there’s potential for weeds to grow in the garden, which can be an overgrowth of bad bacteria. Sometimes it’s too much of the good bacteria can overgrow and become a problem. There can be yeast, there can be parasites, and that’s a condition we call dysbiosis, and that can damage the lining, the barrier function of the gut. Now, there are other things that damage the barrier function of the gut. Like alcohol, and stress, and medications, like prednisone and Advil. So you can damage that gut lining. And those things—dysbiosis and what we call a leaky gut, which is this increased intestinal permeability. There’s really good evidence, and good studies that are laying out the mechanism by which the interior of the gut, like the gut lumen and the cell wall of some of those bacteria that live in there, get into your body and trigger your immune system that’s sort of lying in wait right below the surface. Because you bring the outside world in through your mouth every day. It’s one of your biggest exposures to the outside world, is what you eat. And your immune system is just waiting to make sure to protect you. But with a leaky gut, it ends up seeing many things it’s not supposed to. It’s just way too much stimulation, and the immune system can get overactive. You can get inflammation, and you can end up with autoimmunity. Now, when you mentioned before—that’s the third step. Step one, two, we jumped to three. But I sort of did because it’s so important, and everybody with autoimmunity, everybody with arthritis, must make sure their gut microbiome and their intestinal lining is in good shape. And how does somebody know if it is or not? I would put forth that if you have an autoimmune condition, you’re virtually certain that it’s not good. And then we could talk about how to heal your gut, which is the going forward part. But I would say that—and there are plenty of people listening without autoimmunity. And maybe you have some gut issues. And you have reflux, or gas and bloating after you eat. Or you were diagnosed with IBS. How do you know what’s going on? That’s where history can be really important. And that’s where people go back and say, “How did we get here? How did we get where we have an epidemic of autoimmune diseases? And we have an epidemic of gut problems?” Which we do. Because we know from research and studies that people have leaky gut and dysbiosis and immune issues because of that, but also all the IBS, and the people taking Zantac and PPIs. It’s an epidemic problem. How did we get here? And that’s where it’s sort of fascinating to look, which we won’t dwell on, but that whole idea about, “How do you develop a good healthy gut? Where does it come from?” And the idea of vaginal birth, and what you get from your mother’s birth canal. And dirt, kids eating dirt. Maybe we’re too clean. And then our children aren’t being exposed to the kinds of toning of exposure that they’re supposed to have. There’s a lot of discussion—overuse of antibiotics as kids. So I do like to take people’s history. And if anyone is interested, in the way I structured the book there’s a whole assessment section where you can self-assess. And some of that is digging into your history. Figure out if you’ve always been a gut person. And it will color a little bit how long your treatment might need to be. Because if you’re a person who always had digestive issues, and you’re a person who took a lot of antibiotics, chronic ear infections, strep throat growing up. Maybe a C-section, took steroids, ended up having an injury that needed a lot of pain medications. There are all sorts of stories that you get from people. Your dysbiosis and leaky gut might be pretty significant and you might need to do repair work for a little bit longer than somebody else. Does that make sense? DrMR: I think it makes complete sense. And let’s jump a little bit deeper into the gut. Because I know the audience is definitely a very gut-privy audience, and it’s something that we talk about quite a bit. And I completely, completely agree with you that one of the most profound things we can do to improve our immune/autoimmune health is improve the health of our gut. So let’s go into a few details. And this kind of bridges on diet, because I’m sure gluten-free is one of the bigger facets that come up. And I think people probably listening are generally familiar with gluten free and how that may pertain to autoimmunity. But anything there outside the normal party lines that you would offer? DrSB: Yes. I would. And I will say that people might not like me. I’m a little bit of a renegade, so I do have to say that I don’t always go along party lines. And I’m just coming fresh off of really digging into the research on this from writing Healing Arthritis, the book that’s coming out. There’s a whole section on how to eat for a healthy gut. And I reviewed all the food, all the research on food and diets, and how to eat for arthritis, and studies looking at that. I want to preface it though, by saying about gluten that we don’t really need to talk about it. This is not about gluten. This is really about what food plan is the best for your gut. Of course you need to remove foods you’re sensitive to and that are damaging to the gut. So that’s number one. And that’s the category I’d put gluten in. Gluten has been shown to damage what are called the tight junctions, which is the glue between the cells. That increases the permeability. It increases something called zonulin, which opens the gates, and increases a leaky gut. And there are all sorts of other reasons. You’ve got a savvy audience; we’ll move on from that. So I always do an elimination diet at the very beginning of working with someone to figure out what foods you might be sensitive to, and we remove those. So that’s sort of a given. And gluten is associated with autoimmunity, so I really do advise all my patients who have any autoimmunity to adopt a gluten-free diet. So that’s that. But here’s the thing. When you look at food plans, and you look at studies looking at different— especially in people with arthritis, but also looking at people with how it affects the gut, and the gut microbes, and a more inflammatory pattern in the gut versus what looks healthier or is in more the healthier people, their pattern and their gut. The food plans that work the best are Mediterranean diet, vegan, and vegetarian. Plant based, high fiber, some healthy fats. It’s really a plant-based diet when you think about it. When you think about a Mediterranean diet, it’s mostly fruits and vegetables and legumes. DrMR: Susan, not to cut you off, but let me pierce into this, because there’s a key question I want to ask you. I partially disagree with you, but I think we can definitely have a healthy discourse on this, and the audience will probably learn a lot from it. So, I agree with much of your point, which is diets that are highly fermentable, high fiber, high prebiotic diets tend to improve the microbiota, the microbiome. But one of the challenges I came across in looking at this literature was we feed gut bugs, to use a very broad term, but that doesn’t always correlate with an improvement in the disease index. And that’s, I think, a key piece has been left out of a lot of the microbiota literature, showing that the diet carries over from changing the microbiome to actually improving said disease activity. DrSB: Right. Well it does for arthritis. I will tell you that there’s research showing. They did studies on rheumatoid arthritis. And I can’t tell you about all the other autoimmune diseases. I haven’t dug into those. But for just talking about arthritis, and that is a really important point, though. Because I have friends who are strict paleo, and I have friends who are plantrician—they don’t eat any fat. That whole sort of Neal Barnard, Esselstyn group. And those studies have been really good on cardiovascular disease, right? But in autoimmune and arthritis, which is where I’ve done my most recent research, studies showed that people that ate a Mediterranean/vegan/vegetarian diets, the gut microbiome changed, the CCP and inflammatory markers went down, and it was correlated with an improvement in their symptoms, in the joint pain. So they actually did correlate the changes in the gut with the symptoms. So people are looking at that now. I’m not against paleo, and I don’t want to sound like I am. I was going to sort of finish and clarify that. I think we can all get really carried away with recommending or giving extreme—I think that different health conditions, and people with different genetics, you have to look at the person before you and personalize everything. DrSB: And all I’m saying is that in inflammatory conditions, certainly like rheumatoid arthritis, what they’ve seen is that, yes, the fermentable foods that increase short-chain fatty acids. You see the short-chain fatty acids go up. And the literature on what the butyrate does, and the short-chain fatty acids in repairing the junctions, the tight junctions, and improving the barrier, and increasing the mucus in the gut lining. Really interesting stuff on what the short-chain fatty acids do. So unless you feed at least enough of your diet are vegetables, and colors. It’s polyphenols and bioflavonoids, you know. It’s these colors in the fruits and vegetables. I’m not saying you have to eat grains if you don’t want to. But you need to eat plants, and the plants are going to ferment and increase the short-chain fatty acids, and that’s going to really help the barrier function and your gut microbes grow. The studies also showed that people who eat really low fiber, high animal, do not have the same pattern of microbes in the gut. DrSB: And those studies are not beneficial, and people with arthritis did not feel better on those diets. DrSB: Well when you say both sides, what do you mean? What’s the other side? DrMR: So the other side of this argument, in my opinion, is that there are a lot of people with underlying digestive immune dysregulation and/or autoimmunity who higher fiber diets decimate. And there is a clear amount of evidence, for IBS and for IBD namely, where higher fiber and higher prebiotic diets make their autoimmune condition worse. Even though their microbiota looks “better”, their inflammatory cytokines go up, the disease activity goes up. So I always try to preface that, because I see so many people come in trying to force down more fiber, and it’s actually making them worse. DrSB: Yes. I’m glad you said that. So let me clarify how to approach this. When somebody is really sick at the beginning, we have to pull all these foods out. And we do a very restrictive food plan. There’s autoimmune diets. Take out all the grains. I treat a lot of SIBO, small intestine bacterial overgrowth. I do inflammatory bowel disease, I treat it all the time. I don’t put them on a Mediterranean diet. So I didn’t mean to make it sound like I do. So let’s just—and actually this is a really, really, really important point. And in a couple of my last speaking gigs, this is actually what I’m talking about these days. There’s the initial work that we do with people where we restrict, and we take away a lot of foods, and they need to because they’re so sick. The gut is such a mess, they can’t tolerate the foods, they’re so inflamed, and I completely agree. And that’s what I do as well. And I call that sort of the quick fixing, and the beginning, and the jump start, and what we do for the first several months. But here’s the thing, you have to help people move into a sane way of living for the rest of their lives. DrSB: Those really restrictive plans—I call it finish what we start. We have to give people the step to what comes next. What comes after you heal your gut? After a year and we’ve done all this gut healing work. The gut is in better shape. We’ve treated the SIBO. They can tolerate fiber again. Because ultimately, we don’t want to tell people, someone who is 40 years old, to never eat fiber for the rest of their lives, because that’s not good for the gut. And that’s what I’m trying to get to. The long-term plan is to heal the gut. A healthy gut should be able to eat food like that. So we want to help try to get there. And then the long-term play is to try to eat plants as much as possible. Listen, I usually tell people—Ok, paleo, you want to eat animals. I’m actually not anti-animal, at all. I try to encourage my patients to eat 30% animal, 70% plants. It’s where I try to draw that line. I think that’s an alkaline kind of diet, because you want to promote the body metabolizing the food and being more alkaline as opposed to creating more acidic end-products from the food that you metabolize. And that’s another whole thing which I dug into the research on that. So that’s just my personal sanity. I think after we do our magic—we can call it magic—but after we’re really working with our sleeves rolled up, and people are eating in a really restrictive way, I just think we have to have, as a goal, where are we heading? What’s the long-term plan here? And I don’t think those restrictive diets—for me, my goal is not to leave somebody on that for the rest of their lives. DrMR: Totally agree. And I’m glad we had that back and forth, just because I think if you’re someone listening to the conversation, it’s easy to pick one snippet, and then use that in perpetuity rather than understanding, like you said, and I’m in complete agreement, we have this initial phase of healing that’s going to be a bit more restrictive, and then the long-term goal is to get someone on the broadest possible diet as we can. Whether that be a little bit more Mediterranean or Pritikin-ish, or it’s a little more Atkinsonian or paleo-ish, I think will depend on the person’s individual variation. But we’re always going to be trying to incorporate non-processed foods, of course, and a decent amount of fruits and vegetables into that diet. Definitely. DrSB: Right. And so for supporting the health of the gut, you want to get to a place, if you can, where you’re going to be eating a lot of color. And fiber, whether it’s in the form of grains or it’s in the form of the vegetables, but you need to feed those bugs. And a healthy gut is a healthy immune system. And studies are very clear that when you change your food, within 24 hours your microbes change. So the single most important influence you can have on your gut, number one is food. And the thing about eating too much animal—and even when you said Atkinsonian. I’m not a promoter of eating 70% animal for your whole meal, for your whole days’ food, because your microbes are going to ferment that into ammonia and other nitrosamine, I think it’s called, compounds that are cancer producing. There’s pretty good evidence about that. Short term, if you want to do that to lose a few pounds and feel better short-term. But I’m really trying to help people understand there’s the short-term, and then there’s for the long-term. It’s pretty clear what’s good for our health. DrMR: Alright. So let me ask you one here, because I really enjoy having this kind of back and forth. Because again, I think we can find studies showing any healthy diet that focuses on non-processed foods produces a health shift. But what about the studies that have looked at the paleo diet. And again, I’m not a paleo-only advocate. But they’ve done side by side trials looking at more traditional dietary advice, which is higher in carbohydrates, grains, what have you, compared to a paleo diet. And for many cardio metabolic conditions, that diet tends to have a little bit of a favorable impact on body composition, energy, blood glucose, cholesterol levels. How would you account for that? DrSB: But the question is, what do you mean by paleo? I mean, I like paleo. But I like the way Mark Hyman does it, a little bit. It’s all vegetables. It’s a lot of vegetables. The plate is filled with vegetables, and then there’s 4 ounces of protein. How are you doing paleo? The old Atkins way, and I remember this very clearly. I had one of my first patients ever, many, many, many years ago. And he was having a bacon cheeseburger for breakfast without the bun. And eating really bad fat. The quality of the fat was inflammatory. The animals were inflammatory. And there was not one piece of green that he ate all day. That is not a healthy way of doing paleo. So I think you can totally do it. Like Terry Wahls, you know. She has a great version of paleo. I love that. So I’m not against paleo, but I think that there needs to be a balance. I don’t know what paleo means. What’s the percentage of animal versus the percentage of vegetable? And I think everybody has a different take on that. I think if you limit—I don’t know if we’re disagreeing or not, but I do believe, because we both sort of agree, but maybe we’re thinking—but the studies that I’ve seen looking at—I think it’s definitely a change in the microbiome to generate more ammonia if you’re really focused on too much percentage of animal for your whole day, day after day after day. And I don’t recommend it. That’s all I can say about that. Now but I will say—so bringing the sanity back, and let’s talk about what we can agree on. Reviewing all the food plans, a lot of them are all successful because we all agree on certain principles. And I call them my 5 guiding principles for choosing food. And these are things we all agree on. And I think if everybody does this, everybody feels better. Number one, get the sugar out. Get rid of the sugar, get rid of the processed flour. All the processed food stuff. The high fructose corn syrup. So you’re eliminating processed sugar and how it shows up in your food. That’s number one. Number two, eating healthy fats. Getting rid of all the processed oils. French fries, things that are fried. High heat processed canola and vegetable oils in your foods. So choosing healthy fats. Quality. Really looking at the quality of the food. That kinds of fats you eat. Number three: animal. Choosing—what kind of animal are you eating? I don’t think a lot of the food plans or the studies have controlled well for the quality of the animal, the different kinds of fats depending on what the animal ate. Right? You’re eating what they ate. So what the cows are fed, translates into what their meat is and what you’re getting into your body. So grass-fed, and grass-finished. They’re not eating GMO corn and being given antibiotics and hormones. And that affects your health. So quality of the animal. Getting rid of preservatives and dyes and the toxins that come in with the food. And then the last number, five, is choosing a lot of colorful foods and bringing them in as much as possible. And I think we all agree on those things. DrMR: Completely agree. And if someone does all those things, I would totally anticipate they would feel much better. DrMR: Much better. And it’s funny. We had Christopher Gardner on the podcast a while ago. He’s a PhD at Stanford. He did that trial called the A to Z weight loss trial, where he had people go on diets all the way from Atkins through Pritikin, and followed different cardiometabolic markers. And he said, you know it’s funny that probably 80% of the benefit from these diets is the concepts that you just mentioned. DrSB: Right! That’s I guess the point I was making. DrMR: And then we argue over the 20% differences between whether to be paleo or what have you. So I’m in complete agreement with you there. DrSB: And so here’s the thing, just to circle us back to where we were on the immune system and gut health and all that. I just wanted to point out to listeners that the research very much supports that these food plans have been effective in studies. That’s all. And improving the gut microbiome in a way that’s translatable to improving symptoms of arthritis. You know, Mediterranean, which is a very easy balanced way to eat. And you can do it gluten free. You can take Mediterranean and make it your own. It’s a very sane way to go. And I think it’s an easy thing for people to follow. So I think it just helps bring it hope to the reality that we’re looking for balance, and we want to help people get to a place that’s easy to follow for the rest of their lives, and not the way we’re working at the very beginning. DrMR: Completely agreed. And I can’t agree with you enough, because I’m sure you see patients similar to this also, where they come in, and they’ve worked themselves to a pretty restrictive diet, and they think they need to be on that diet for the rest of their lives. And they’re almost afraid to bring in other foods. That definitely I don’t think is good. DrSB: But then we help them heal. So healing the gut. Maybe we could talk about that for a second. So healing the gut—and actually I do want to say, that’s why food is right here. So the four-step program for healing your immune system is figuring out the food, right? Which at the beginning can be very restrictive. And I definitely do elimination diets and all that at the beginning, as well. Number two is stress. So the second most important influence on your gut microbes and your leaky gut is actually stress. And cortisol, the stress hormone. When you have stress and you feel stressed, you’re releasing hormones called cortisol, is one hormone. And your nervous system gets activated. Your sympathetic nervous system, which think of it like adrenaline. And your nervous system is hardwired into the lining of your gut. It’s hardwired into the immune system around the gut, your whole intestine, small and large intestine. And cortisol is released into the gut lumen, as well as in the lymph nodes around the gut, and it completely changes your microbes and the functioning of your immune system in and around the gut. So, we don’t realize sometimes the importance of not just how stress affects the immune system directly. And it skews it. It suppresses one part while increasing another, just makes it imbalanced, your stress system. But it really affects the gut. So when I talk about step 2,sort of balancing your stress hormones and working with stress, it’s for your general immune health, but it’s also indirectly a big effect on the gut health, as well. So for long-term gut health, I see all the time people doing great. I do stool testing, and I use herbs to sort of weed the inner garden. Clean out the weeds from the overgrowth of bacteria, perhaps. Treating the dysbiosis with herbs is how I prefer to do it. And we treat the gut, and people are getting better. We’re working on healing the leaky gut with glutamine or other compounds. Sometimes I’ll use curcumin—anyway, we can talk about supplements in a second. And then all of a sudden, a big stressor comes along, and bam! They have a flare of their symptoms and they feel crummy again and the gut goes wonky again. So I just want to put out there that people need to realize that the stress really does matter. It’s not something—we’re like, “Oh yeah, I know I’m stressed.” We all know we’re stressed. And people sort of shrug it off. But in my experience, it’s had a powerful effect on the ability of people to stay with their program and continue healing, especially if something big happens in their lives. DrMR: I completely agree. And we’ve talked about some things like therapeutic time in nature, or forest bathing as it’s being called in some of the studies in Asia and how therapeutic that can be. Just the direct impact. College students under exam stress, or the pre-exam period where they’re studying for the exams have been shown to have a dwindling of Lactobacillus and Bifidobacterium species in the gut, just from the exam stress. And certainly the IBS and IBD literature shows the disease activity and flares are more common when people are under stress. So completely, completely agree. And we’ve talked about this on the podcast before, about a couple of things for the healthcare consumer to be especially cognizant of is, like we talked about earlier, not being overly obsessive or fearful regarding your diet. And one of the biggest areas I see this is the occasional exposure to gluten is going to totally ruin my immune system, and people get so worked up about that, they shy away from time with friends and family and what have you. And certainly if you have a very strong aversion to gluten, avoid it. But don’t be unnecessarily fearful of it. If you don’t need to live like you have celiac, then don’t hold yourself to that kind of standard. The other is health research. Sometimes people spend way too much time doing health research on their mobile device or computer. DrSB: I know! Health anxiety. DrMR: Mmhmm. And that’s also been clearly documented that the more time people spend on the internet or on social media, the higher their scores of anxiety and depression go, and the lower their sense of subjective wellbeing. So these are simple things, and that’s why I think we both harp on them, Susan, is because they’re simple, they’re free, and they’re shown to be super effective. DrSB: Right. And I think that intellectually we know that stress and stressors in our lives, and the way we bring stress into our body, has an effect. But it’s very easy to be dismissive about it, or not take it seriously enough to actually make some lifestyle changes to put into place, to really be able to be successful in your long-term program. I think of it like the terrain of your body. It’s like the soil that everything grows in. The soil that all your cells grow in. And I don’t know, I’m sure you’ve had this experience as well, where somebody comes in and we start working together, but it takes time to shift the terrain to a state of health. We’re not just treating illness, we’re working towards health. And I’ve been doing this a long time at this point, and people I’ve been working with for many, many years—my vision is really one of working towards health, and not just treating disease, or looking for disease. And really to do that, you have to be living in a way that supports a healthy terrain. It’s like your soil that’s deep inside you. And that’s where the stress comes in. That’s where the food comes in. And exercise. That’s the whole lifestyle piece. And sleep. Sleep, exercise, what you’re eating. And then the final thing is detoxing your world. Looking around and making sure you’re not exposed to too many toxins. Toxins are very stressful on your immune system. So you really want to be—you’ve done that on the podcast before, people are aware of environmental toxins and how to sort of avoid them. DrMR: Let’s go into a little bit of that, because I’d like to hear some of your take on expanding on that. DrSB: Yeah. So I guess I was just going through how do we live in the world and be as healthy as we can. And this is me just being my preventative medicine, which is, “How do we move towards health?” And, treating complex chronic illness, “How do you reverse it?” It’s sort of two sides to the same coin, because we’re using these same sorts of ideas and principles towards reversing illness that we want to be using towards moving towards health. And so removing the toxins from the body is important if you have an autoimmune disease, for sure. If you have inflammatory disease, toxins like mercury. But it’s not just mercury. It’s things like pesticides. It’s all the persistent organic pollutants we live in. It’s glyphosate from Roundup, which damages the gut. And there’s some really interesting emerging literature on that. How I like to explain to people, and this sort of brings me back a little bit to when you were saying about how to put the past in perspective. At this moment, if I close my eyes and imagine someone sitting in front of me, that I’m going to try to figure out their toxin load. You have to think of your toxin load as an accumulation of all the exposure you’ve ever had throughout your lifetime. And balance that with your genetics, which there’s a genetic predisposition to being able to clear toxins well. So there are some people handicapped, and I’m one of them, and I know it because I’ve done my genetics. There is a certain genetic test you can do looking at glutathione pathways, etc., which we can talk about another day. But there’s genetics. And then there’s how well you’re supporting your liver with nutrients. How well have you been feeding yourself? And able to digest and absorb those nutrients. What does your liver need? Your liver needs antioxidants. Your liver needs greens and cruciferous vegetables to give you some of those indole-3 carbinol and sulforaphanes that help your liver detox. So you need to be eating foods to support your liver. Eat them, digest them, and then assimilate and absorb them. So you need a healthy gut, is in there a little bit for detox, right? So you need nutrients. And you need genetics. And then you balance that against all your exposure. And have you been able to keep up? So right now in this moment, anybody listening, your toxin load is a balance. It’s a net. It’s a net-net, from how much you’ve been exposed to and how well you’ve managed it. Right? And the only way to really get a handle on that is to do a little history. Were you an art major in college? Did you do all the oil-based paint? Did you live through a renovation in a house, and you lived in the dust of a house that was built in the 1920s? How much fish are you eating? There are a lot of things you can think about in terms of history. Were you exposed to some—I had people share that they had planes that dumped pesticides over them in a summer when they were living in the country. And they had this big exposure. And often we can dial it into them feeling sick shortly after that. People from New Orleans after—gosh, I have a patient that got scleroderma after the big gulf oil spill. And she was still eating all the shrimp and seafood from the gulf for that whole year right afterwards. So there are things that you can get from history. And I think that’s important. And then you go forward, and you have to find a way to get some of those toxins out. And the way that we address that from a functional medicine perspective is to support the liver. Support the liver with nutrients. Sort of turn that filter on and give it a boost to help it remove toxins. All toxins. Sometimes we measure mercury and we go over the mercury specifically. And we could do that with chelation programs. There are ways to go specifically after mercury. But don’t just only go after mercury when it comes towards autoimmunity, and forget about just the total toxin load. And then going forward, moving towards health, you have to detox your life. You have to live a detoxed lifestyle. And that’s looking at your cleaning supplies, and your cosmetics. This is for those people listening who are the canaries. If you are sensitive, and you have an autoimmune disease, you have genetics that predispose you, perhaps, to this. So there’s a great website I send people to, the Environmental Working Group, www.EWG.org. And they have everything about toxins that you ever want to know. But don’t get health anxiety while reading it! I’m not looking to make everybody crazy. But I do think—and this is where eating organic comes in. And the Environmental Working Group has a great list of the Clean 15 and the Dirty Dozen. So if you can’t afford organic for everything, which isn’t necessarily necessary for everything. There are certain foods that are very low. And that website will give you lists. So I got that all in. Was that too quick? DrMR: —At once you will drive yourself nuts. So just pace yourself, and make it a gradual process, and don’t overwhelm yourself. DrMR: Because it’s easy to do that. DrSB: No health anxiety. And here’s the other thing. Find an integrative practitioner or functional medicine practitioner to help you if it feels too overwhelming. And also, in terms of my book, The Immune System Recovery Plan, I laid it out. Step four, supporting the liver with detox. I have all sorts of self-assessments. Very simple ways to start. Some simple supplements you can use to really reboot your liver and sort of help your liver do a better job. And I’m just saying that in the context of, there is support out there. If you’re getting overwhelmed, if it just feels like too much, and you’re getting anxious, find someone to help you. You don’t need to do it alone. Because this can be a lot. DrMR: Yeah. Especially if it’s not your full-time job. I mean, it’s hard for us sometimes managing it all, as clinicians. DrMR: And it’s our full-time job. DrSB: And it’s our full-time job. Yes. DrSB: So we definitely need to support people. And that’s actually one of the reasons I created a website. It’s called www.BlumHealthMD.com. And it’s a whole sort of interactive digital platform for helping people do programs. So I have a heal-my-gut program on there, there’s a detox. The detox one is going up in the next few weeks. But there’s health coaching, and really my goal was—I call it “do it with us.” To help do the book with people. To support people to do the book as they’re going through it. And I’m going to have an arthritis program up by the summer, to help people do the arthritis program with support. Because people really need support. And I know that, from practicing functional medicine for the past 15 years. We now have a fulltime health coach in the office. I have a full-time nutritionist. There’s really a lot of people to support the health journey. Because it can be hard on your own. DrMR: And regarding RA. I wanted to ask you a question as we kind of slide to a close here. But are you finding, or do you have much familiarity with people who are sulfur sensitive and rheumatoid arthritis? This is something I’ve been seeing more of lately, and I’m wondering what your perspective with that is, or your experience. DrSB: Well it’s interesting you say that, because I’ve recently been looking into and becoming aware of that as well. And you’re talking about sulfur sensitive in terms of sulfur foods? DrMR: Yeah. Sulfur foods would be one of the main sources that people would be exposed to sulfur. The challenge there can be, and this is kind of akin to a FODMAP diet, or a low FODMAP diet, is they look healthy. These vegetables look healthy at face value, but for some people they actually make them sick inadvertently. DrSB: Yes. Well yeah. And so we’ve been looking at that as part of—I find that people with rheumatoid arthritis, you really need to work very hard with them on a food plan at the beginning that doesn’t cause symptoms. They have a lot of digestive symptoms. And thus, the connection between the gut and the arthritis for sure. And we’re finding also, when it comes to sulfur, that there’s a lot of people that have SIBO that have sulfur SIBO. And that’s really hard to pick up, you know. Most SIBO breath tests are methane and hydrogen, as well. So yeah. I’m not really—one of the big “Ah-ha’s” for me for rheumatoid arthritis—so yes, I’ve been recently starting to think about that. Especially for people who don’t do well right at the beginning. You have to start to figure out what about this person. The other big tidbit about rheumatoid arthritis is about the oral microbiome. And until I dug into the research, there was an enormous body of research about periodontal disease and the association with rheumatoid arthritis. And so, you really have to attend to the oral microbiome, as well. Right? So as we’re digging into the gut and we’re talking about the gut microbes, I think that it’s really important to ask people about periodontal disease, especially if they have an antibody called a CCP antibody for RA. There’s a whole subset of people that have their mouth and bad bugs in their mouth triggering their RA. And you have to help them clean that up by working with a periodontist. I often will have them use a Waterpik, and I use my own herbal mouthwash or hydrogen peroxide in a Waterpik. We really work on the oral microbes as well. So that’s also another little thing about rheumatoid arthritis, since you brought it up. It’s actually quite a big thing. DrMR: Yeah. I think the best evidence for the mouth having any kind of impact on any condition is for RA definitely. Cool. Well Susan, thank you for being a trooper and getting through some of those hairy points on the diet. DrSB: That was great. I think that’s so beneficial for people to see a healthy debate. DrMR: Yeah, because when people disagree with everything each other are saying, the audience doesn’t learn from that. But when we can share our perspectives, our rationale, our justification, I think people learn a lot from that, totally. DrSB: Yeah. And we ended up, we were saying the same thing. We ended up coming to agreement anyway. DrMR: Yeah. Because we’re both really smart, right? So of course we did. DrMR: I’m just kidding. So where can people connect with you or find more of your readings, writings, or what have you? DrSB: So I’m very busy getting things out for people to read and to learn from. One of my favorite things I’m doing is I’m doing Facebook live every Tuesday at 1 o’clock, East Coast time. So you can find me on my fan page on Facebook. And I take questions, I do a different topic every week. I do a half an hour on Facebook live, and that’s really fun. I do have a YouTube page with all the old videos, and it’s all libraried. So I have a lot of information. I’ve done probably every topic out there at this point. I’ve been doing it for a while. So definitely Facebook live and YouTube. I have a lot of that stuff. Go to my website, sign up for my newsletter. We send out—we post a blog. I post with my staff. We all contribute to the blog every week. We have something every week happening. We send out a newsletter. www.BlumHealthMD.com is the main interactive website where we’re available. We answer questions, you can submit questions online. I have a health coach that mans the whole thing, and sends me things she can’t answer. So yeah, I’m very much interactive and available. So come find me. Come talk to me. Come ask me questions. DrMR: Awesome. Well Susan, thank you again. This was a great conversation. And until I bump into you at a conference here hopefully, I will keep following your work. DrSB: Ok great, thank you. Same to you. Same for me with you. I really appreciate being on here. Thank you for listening to Dr. Ruscio radio today. Check us out on iTunes and leave a review. 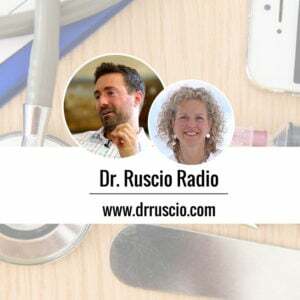 Visit www.DrRuscio.com to ask a question for an upcoming podcast, post comments for today’s show, and sign up to receive weekly updates. That’s www.DrRuscio.com. Does Dr. Ruscio have a post addressing the most trustworthy supplement companies/brands? If not, I think a blog post or quick podcast evaluating supplement companies would be a huge benefit to listeners. With so many low-quality supplement companies out there I want to make sure that I am getting quality products and want more substancial input than Amazon reviews. I want to maximize quality for price, but can’t sustainably afford the supplements offered through my local functional practitioner. I’m currently looking at brands like Nordic Naturals, Pure Encapsulations, Zenwise, and Bulk Supplements. Great question Laura. I will address this in my book. To your question, no post to date. I have added this to my list for listener questions. I am interested in protocols for oral chelation of toxic minerals/elements. Do you have any recommendations? I’m not super current here so I don’t have much to offer.